← Did a rough & tumble lumberman sip from this historic bottle? 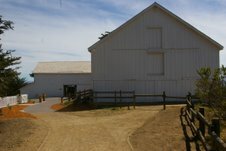 Yesterday Meg and I went to the brand new Interpretive Center’s Grand Opening at Ano Nuevo State Park. 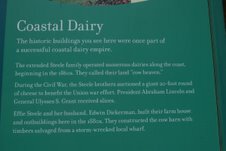 This over 3- million dollar addition to the state park was constructed in the old buildings of “The Steele Dairy,” on Point Ano Nuevo. 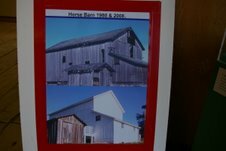 The old cow barn holds the Marine Education Center. holds a theatre and classroom and the two- story creamery has been converted into the headquarters for the hundreds of volunteers and the park office. 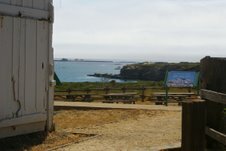 There are interpretive displays inside and picnic tables outside with a to-kill-for view of Ano Nuevo Island from this historic point. Best of all (in my mind) there is a warm, sheltered spot to gather in this often windy and cold spot, while you wait for your docent-guided tour to see the Elephant Seal’s rookery further out the point. When you’re poking around in the barns note the giant weathered timbers used to construct them. 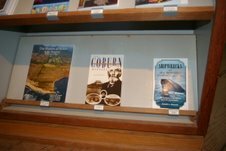 A sign mentions they were salvaged from a storm-wrecked local wharf.